An international team including researches from nine countries, and led by Abhishek Kumar Srivastava from Department of Physics, Indian Institute of Technology (BHU), India, reports on a new discovery made by using the observations from Interface Region Imaging Spectrometer (IRIS). The observations show first ubiquitous presence of pseudo-shocks around a sunspot and the energy transfer by these pseudo-shocks into the overlying corona. The pseudo-shocks serve as substantial sources of energy and mass flux to compensate the radiative and mass losses from the solar corona located above this sunspot. The work is published recently in Nature Astronomy (Link to publication). Other team members are K. Murawski, B. Kuźma, Dariusz Wójcik from UMCS, Poland; T.V. Zaqarashvili from Space Research Institute, Graz, Austria; Marco Stangalini from INAF-OAR, Rome, Italy; Z.E. Musielak from University of Texsas, USA; J.G. Doyle from Armagh Observatory and Planaterium, N. Ireland; Pradeep Kayshap from University of South Bohemia, Czech Republic, and B.N. Dwivedi from Department of Physics, IIT (BHU). This discovery provides the significant clues about new dynamical plasma processes, known as pseudo-shocks, which act as an energy source for the active solar corona to compensate its radiative losses. 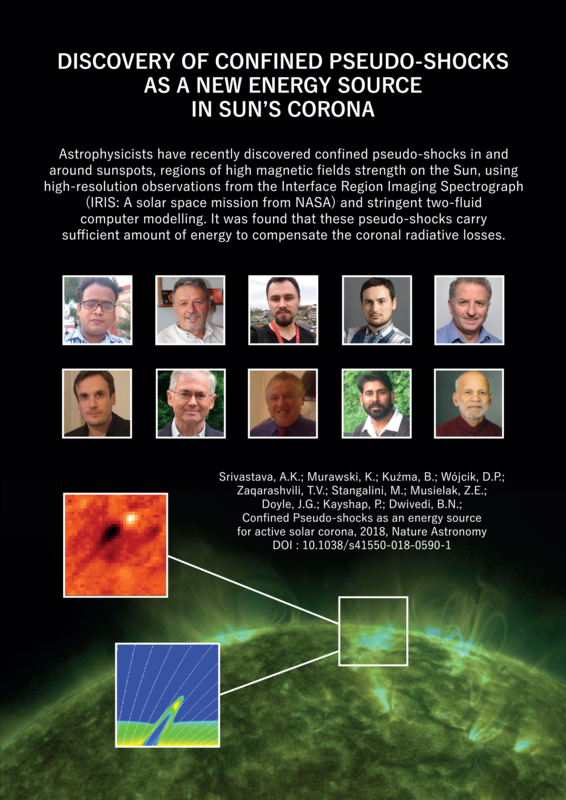 This novel finding on the first observational discovery of confined pseudo-shocks will provide a new horizon to understanding the physics of the solar atmosphere and energetic processes using modern age upcoming solar telescopes from ground and space, like 2m Indian National Large Solar Telescope; DKIST, a 4m telescope in Hawaii; Parker’s Probe; Aditya-L1, etc. The work gives new insight into our understanding the energy generation, and its transport in the solar atmosphere, especially to the highly dynamic active solar corona. The consequences of this discovery are far reaching, especially for the origin of the fast streams of the solar wind and its prominent effects on heliosphere, and space-weather near our Earth and other planets in the Solar System. Pseudo-shocks were first noticed in supersonic duct flows in 1958 by L. Crocco, which can be decelerated to subsonic velocities and were ascribed to a possible adjustment of the velocity distribution itself. Unlike shocks, pseudo-shocks exhibit discontinuities only in the mass density, and being firstly observed in Sun’s magnetized atmosphere.